In this paper, dynamic meta modeling is proposed as a new approach to the operational semantics of behavioral UML diagrams. The dynamic meta model extends the well-known static meta model by a speci.cation of the system’s dynamics by means of collaboration diagrams. In this way, it is possible to de.ne the behavior of UML diagrams within UML. The conceptual idea is inherited from Plotkin’s structured operational semantics (SOS) paradigm, a style of semantics speci.cation for concurrent programming languages and process calculi: Collaboration diagrams are used as deduction rules to specify a goal-oriented interpreter for the language. The approach is exemplified using a fragment of UML statechart and object diagrams. Formally, collaboration diagrams are interpreted as graph transformation rules. In this way, dynamic UML semantics can be both mathematically rigorous so as to enable formal specifications and proofs and, due to the use of UML notation, understandable without prior knowledge of heavy mathematic machinery. Thus, it can be used as a reference by tool developers, teachers, and advanced users. Object Management Group. 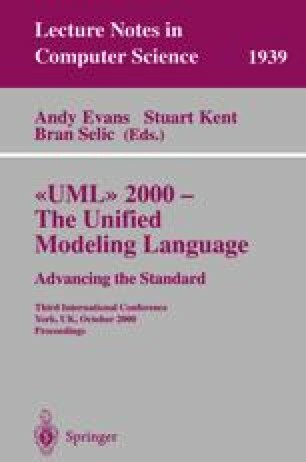 Action semantics for the UML, November 1998. http://www.omg.org/pub/docs/ad/98-11-01.pdf. Object Management Group. Analysis and design platform task forceff white paper on the profile mechanism, April 1999. http://www.omg.org/pub/docs/ad/99-04-07.pdf.